Cara finds support in the last person she expected. She realizes that Aelyx isn’t just her only friend; she's fallen hard for him. But Aelyx has been hiding the truth about the purpose of his exchange, and its potentially deadly consequences. Soon Cara will be in for the fight of her life—not just for herself and the boy she loves, but for the future of her planet. What a fun book! I was super excited to read Alienated. It seems like aliens are getting more and more popular in YA, which I'm thrilled about. This book is perfect for fans of Jennifer L. Armentrout's Obsidian. The two main things I loved about Alienated: the romance, and the humor. The romance was very sweet and written beautifully. Based on the summary, I was afraid the romance would come across as cliche, but the author does an awesome job of making the romance realistic. There is no insta-love, and Cara and Aelyx develop a strong friendship before they realize they're in love. Also, the humor was a great touch! I giggled many times while reading this book. Cara's voice is very snarky and sarcastic at times, and many of the other characters have lines that made me laugh. And you can't help smiling at Aelyx as you see him adjust to living in a totally different world. The characters were really easy to relate to. 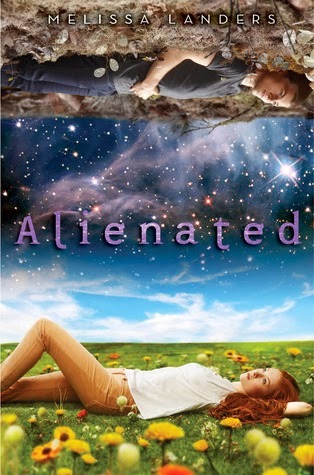 I loved that Alienated has the dual POVs of Aelyx and Cara. This was pretty important to the storyline and it was perfect, as Aelyx and Cara are both keeping secrets from each other. The separate points of view really increase the tension. As for Cara and Aelyx, they were both so likeable. Cara's quick to do what she knows is right, and she stands up for Aelyx despite everyone else shunning him. Aelyx, on the other hand, starts off as a rather distant and cool character. However, he really changes throughout the book and it showed that the author is great at character development. He's so awkward and yet sweet as he tries to get used to all the customs on Earth. I thought it was adorable! Alienated is a great light sci-fi read. I loved the way the world-building was subtly slipped into the story. The mood of this book alternates between lighthearted and heartrending in a way that'll have you flipping the pages. And the plot is fast-paced, full of secrets and action, and will have you biting your nails. There was nothing I disliked. I can't wait to get my hands on the sequel!